Runda, Marie (nee Carruba) Beloved wife of the late Charles H. Runda. Survived by 3 step children, 2 grandchildren, 3 great grandchildren and fifteen nieces and nephews including special niece and caregiver Norma Dobos. Also survived by brother Joe Carruba. Passed Nov. 10, 2018 in Cumberland, KY, Age 88. Marie was a school teacher for 40 years at St. Martin of Tours School. 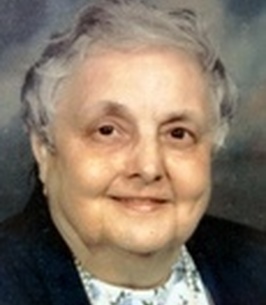 She was a member of the Sisters of Divine Providence from 1948-1968. Family will receive friends on Thursday from 11am until time of Funeral Mass at 12pm at St. Martin of Tours Church, 3720 St. Martin Pl., Cheviot, (45211). Burial to follow at St. Joseph New Cemetery. Memorials may be made to Congregation of Divine Providence, 5300 St. Anne Dr., Melbourne, KY 41059 or to St. Martin’s Church. Mrs. Runda was a great teacher. I enjoyed Mrs. Runda's 6th grade Social Studies class and learned much from Mrs. Runda. She always loved seeing our children in recent years. She was an exceptional person.